Point de gaze, a needlelace which was made in Brussels, Belgium, in the second half of the nineteenth century, was named for its light, gauzy mesh ground (gaze is the French word for gauze). It became very popular, and was used for items of dress large and small, including flounces, fans, handkerchiefs and wedding veils. The designs for the larger items were very elaborate with a variety of decorative fillings and a profusion of naturalistic flowers, often with added petals to give a three-dimensional effect. 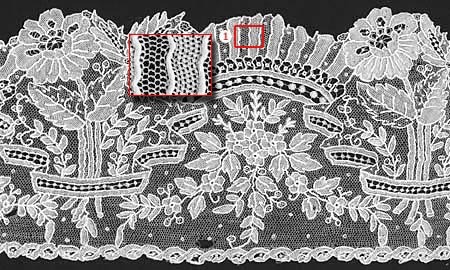 Although my piece is relatively modest, it illustrates all but one of the techniques I described in an article for Lace and an additional one (a ring of twisted stitches) which I didn’t mention there. I found it when rummaging in a local vintage clothing shop — there was no price attached and when I asked, the assistant took one look and said “It’s only machine lace, you can have it for £2.” I was sure it wasn’t but kept quiet, paid up and went home to examine it at leisure.